Often credited with starting the trend of single camera, no-laugh-track comedies on TV back in 2000, Malcolm in the Middle starred Frankie Muniz as a young genius to whom nothing comes easy as the middle child in a middle-class family. After reading these facts about the show, you’ll never need a question repeated. 1. A LITTLE HOUSE ON THE PRAIRIE ACTOR CREATED THE SHOW, AND BASED MALCOLM ON HIMSELF. Linwood Boomer played Mary Ingalls' husband, Adam Kendall, on the hit NBC series before moving behind the scenes on shows like Night Court and 3rd Rock From the Sun. Boomer, like Malcolm, had a high IQ, was the second youngest of four boys, and witnessed his mother shaving his father’s body hair at the breakfast table. He gave Malcolm an IQ of 165, even though his mother never told Linwood what his IQ actually was. When she saw the show, she still wouldn’t reveal the number, but did say it wasn’t as high as her son’s creation. 2. FRANKIE MUNIZ THOUGHT HE BLEW THE AUDITION. The character was originally written to be nine years old, so the then-13-year-old Frankie Muniz thought he was too old, giving his mother a thumbs down as soon as he came out of the audition room. The producers decided to make Malcolm around the age of 12 and give Muniz the part. When the young actor found out he got it, he jumped on the hotel bed. 3. THEY MADE SURE NOT TO REVEAL MALCOLM’S AGE AT FIRST. "We've decided not to say anything about his age on the show,'' Boomer said when the show was just getting started. “It's like the city they live in. We're just saying he's attending middle school, not the actual grade level. We don't want to be locked into something. Kids are so protean with what they say, anyway. Sometimes they act like nine-year-olds and sometimes like 30-year-olds.'' Dad Hal’s actual profession was never mentioned either. 4. THEY WERE THE WILKERSONS. It was never spoken on the show, but Francis’ name tag in the pilot read “Wilkerson,” and a joke cut from the episode had Malcolm confirming it was his surname. A running joke throughout the series became never giving the family a name, going so far as to have future name tags read “Nolastname,” and having the microphone screech the moment Malcolm’s last name was spoken in the series finale. 5. AARON PAUL TRIED TO AUDITION FOR FRANCIS. Aaron Paul (Bryan Cranston's future Breaking Bad co-star) “desperately” wanted to audition for the role of the eldest son Francis, but producers weren’t even interested in having him come in. Christopher Masterson, younger brother of That 70’s Show's Danny Masterson, got the part. 6. BRYAN CRANSTON’S AUDITION TOOK PLACE WHILE THEY WERE BUILDING THE SETS. Boomer claimed that he literally fell out of his chair laughing when Cranston simply put a pipe in his mouth and pretended to look at Lois and one of the kids having an argument during his audition to play Hal. Boomer described Cranston’s look as someone who looked like he was “building a rocketship in his head.” Cranston was hired immediately. It was the actor’s idea to have Hal seem distant because he had a deep inner life. It was also Cranston’s idea to have his character contrast Lois by being afraid of everything, and by being obtuse. 7. IT WAS ALMOST A UPN SHOW. The broadcast network that debuted in 1995 was the original owner of Malcolm in the Middle. After four months, UPN decided Malcolm wasn’t a fit for their schedule after all and let it go. Fox picked the show up immediately. 8. "KRELBOYNE" WAS A LITTLE SHOP OF HORRORS REFERENCE. The nickname given to Malcolm and his fellow gifted students was a reference to the nerdy Seymour Krelboyne, the protagonist of the 1960 Roger Corman-directed film. 9. CRANSTON DID MOST OF HIS OWN STUNTS. Besides the cartwheel and the headstand, Cranston did his own roller disco skating, spending all the free time he had in the week and a half he had to learn how to skate. After one of the show’s writers asked jokingly whether Cranston would be willing to wear a suit of live bees, Cranston said he would—so they wrote a script around the idea. He ended up covered in 10,000 bees, and only got stung once. However, it was not Cranston’s hairy back in the pilot that gets a shave, since the glue on the hair added to Cranston’s back wouldn’t let the razor go through it. A casting session for hairy backs similar to Cranston’s body shape took place, and it was that man’s back seen in the episode. 10. THEY DIDN’T DECIDE ON JAMIE’S GENDER RIGHT AWAY. Lois (Jane Kaczmarek) gave birth to Jamie at the end of the fourth season. But the writers had not decided whether Jamie was going to be a boy or a girl, so they didn’t reveal the baby’s gender until the following season. Jamie ended up being Malcolm’s fourth brother. 11. THE 11-YEAR-OLD NIECE OF THE SHOW’S COSTUME DESIGNER CAME UP WITH AN IDEA FOR AN EPISODE. Alexandra Kaczenski got a “story by” credit on the season four episode “If Boys Were Girls” after writing a two-page outline about Lois fantasizing about raising daughters instead of sons. Linwood Boomer read it, loved it, and bought it soon after. 12. MASTERSON DIDN’T THINK FRANCIS MATURED. "He’s only grown older," Masterson said. "He has the same point of view he’s always had—just with a little more facial hair.” Masterson’s character appeared in fewer episodes in the show’s final years, though he directed the season seven episode “Hal Grieves." 13. CRANSTON MADE FOR LONGER HOURS. Masterson claimed some scenes with Cranston—who directed six episodes himself—took longer than usual to shoot because he cracked everyone up. "It is absolutely impossible to stop yourself from laughing," Masterson told the BBC. "These scenes take so long to shoot as Bryan makes everyone laugh over and over." 14. KACZMAREK GOT TO KEEP LOIS’ CLOTHES AFTER THE SHOW ENDED. One day soon after Malcolm had ended, she was watching an episode where Lois was wearing the same outfit she currently had on. 15. THE SHOW WAS GOOD TO SOME HOMEOWNERS. A privately owned home in Studio City was rented for $3000 to $4000 a day for the exterior shots of Malcolm’s home. The production company replaced the roof after a shingle was lost during a shoot. 16. 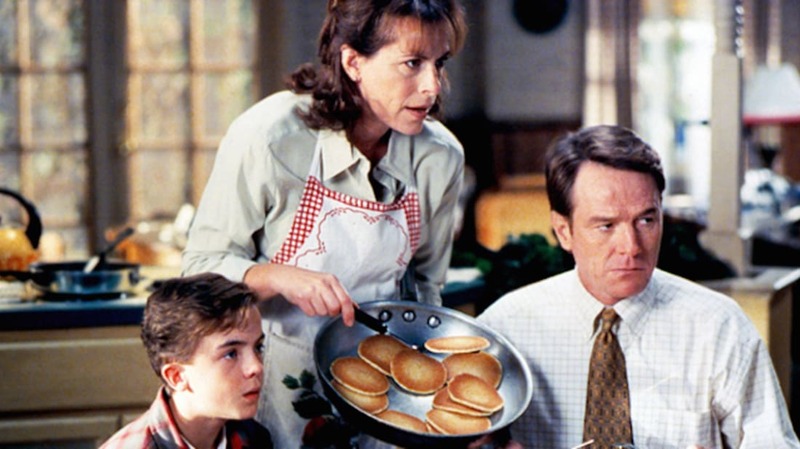 A BREAKING BAD DVD EXTRA REVEALED A CONNECTION TO MALCOLM IN THE MIDDLE. After years of jokes that the ending of Breaking Bad would reveal that the entire series was all a dream of Hal's (a nod to Newhart), a DVD extra showed Cranston and Kaczmarek reprising their Malcolm roles, with Cranston describing the entire Breaking Bad series through cowardly Hal's perspective.